The Marine Corps celebrates its 238th birthday Nov. 10, 2013. The Corps fought in every American war and conflict. To this day, it continues to be America’s elite fighting force. Lieutenant General John Archer Lejeune, (1867-1942) was the 13th Commandant of the Marine Corps. Known as the “greatest of all Leathernecks” and the “Marine’s Marine,” he served for nearly 40 years. His service included commanding the U.S. Army 2nd Infantry Division during World War I and culminated with his service as the 5th Superintendent of the Virginia Military Institute. “On November 10, 1775, a Corps of Marines was created by a resolution of Continental Congress. Since that date many thousand men have borne the name “Marine.” In memory of them it is fitting that we who are Marines should commemorate the birthday of our corps by calling to mind the glories of its long and illustrious history. The “Marines’ Hymn” is the official hymn of the United States Marine Corps. It is the oldest official song in the United States military. 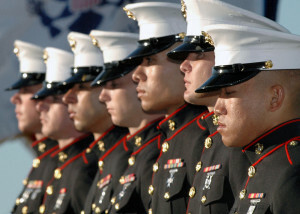 The “Marines’ Hymn” is typically sung at the position of attention as a gesture of respect. However, the third verse is also used as a toast during formal events, such as the birthday ball and other ceremonies.